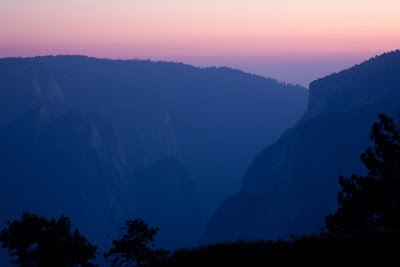 For the past couple of years, I've wanted to venture to the North Rim of Yosemite Valley. I've scoured the topo maps looking for a variety of hikes and after a buddy of mine (Mark) told me about his hike to North Dome with his brother, I knew I had to go there. I didn't want to do the normal out and back from Porcupine Creek like most hikers do. I saw an option for a perfect loop and decided I had to do it. After several failed attempts to get out there, I finally had a weekend free (okay, one where my wife let me get away) and gathered some of my hiking buddies, Tim, Tony and Rafael and headed out to Yosemite for a 2 day 10+ mile hike. Why do this as a two day hike and not a single day? Because I can! Splitting this trip into two days, allowed for a much more relaxed trip, knowing we had no time limits to get where we were going and could stop for whatever photo opportunity came our way. 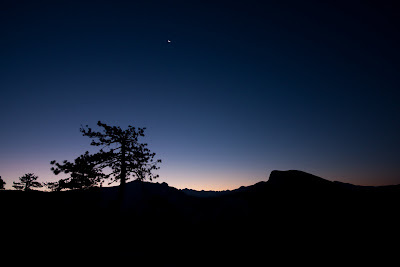 With a crescent moon and clear skies forecasted, we were also hoping for some great night shots over the valley. We weren't disappointed! To paraphrase a famous quote, "what goes down must come up"! That was the story of our journey. We arrived at the trailhead at Porcupine Creek(~8100') early and got our packs on were quickly on our way down towards North Dome. The trail near the trailhead is actually an old paved road for the first .7 miles. The road starts out nice and deteriorates the further you get into the forest. Once past the "road", the trail crosses a couple of seasonal creeks (including Porcupine Creek) and roams through a typical "Yosemite" forest, mix of pines and firs and decent underbrush and lots of dead-fall all around. Within no time (about 1.7 miles) we were at a four-way junction (photo on the right). We almost took the wrong trail, but thank goodness I looked at the topo map a little closer. The first trail heads to the left and down to Mirror Lake and Yosemite Valley via Snow Creek Trail (okay, something I want to do, but not that day). The next trail marker, about 20 ft later was the North Nome Trail to the left. 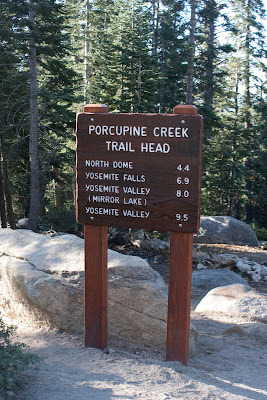 The other trail marker to the right indicated Yosemite Falls. That was going to be our trail on the way back. Okay, we made it to the junction and now it was time to go down hill to the Dome, right, nope. Gotta go up to get down and that's what we did. As you gain elevation, the terrain also changes to more of a chaparral setting, a little more exposed, but starting to gain some nice views too. Our main destination was North Dome, but we did have a planned stop along the way at Indian Rock. 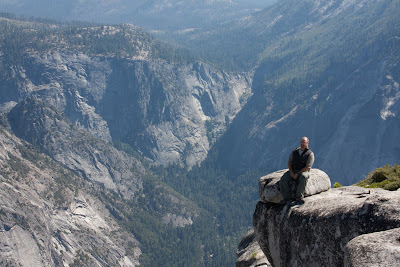 In fact, I think I was more excited about checking out Indian Rock than North Dome. 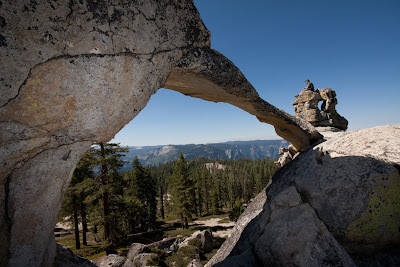 Indian Rock (pictured left) is the only natural arch in Yosemite and it is spectacular! The Indian Rock trail is a .3 mile spur (.6 round trip, but the topo maps show it much further away) straight up hill to the top of Indian Ridge. The rock is a large outcropping of granite that includes a 15 ft granite arch and provides lots of exploring and photographic opportunities. After a couple of hours hanging out at the arch, we continued on down to the Dome. It was really downhill this time. In about a half a mile, the trail splits up, to the left is the "established" trail that continues among the trees, but to the right the trail follows the granite of Indian Ridge. A more direct, but steeper route and the way we went. 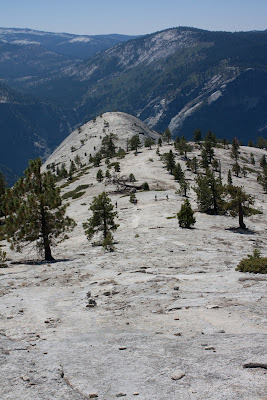 We followed the cairns and were soon greeted with an incredible view of Yosemite Valley and its many icons: Half Dome, Clouds Rest, Glacier Point, Illilouette Falls, etc. We soon met back up with the "other" trail and were on a ridge above North Dome. Getting down to North Dome was more fun. The trail down drops about 200 feet very quickly and soon we were among the trees at the base of North Dome (Numerous trail camps are among these trees). 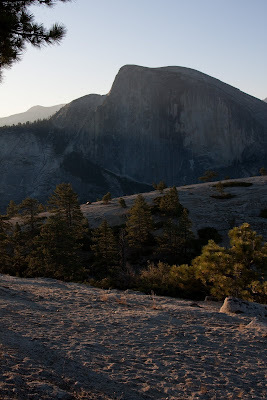 The gradual slope up North Dome was rewarded with a face to face view of Half Dome. We hung out at the dome for a while and headed back up to a trail camp we found on the ridge above the dome. Still fantastic views of everything, but we didn't have to haul our packs and gear down and then back up. One word of caution to those planning an overnight trip to North Dome, there is no water within a mile. You need to pack in water. A breezy afternoon turned into a calm and perfect evening, barely a breeze and a clear night. Shutters were clicking all around our campsite. The sunset wasn't as spectacular as I was hoping but it was special. The stars were incredible and after draining my camera battery, I hit the sleeping bag under the stars (no tent for this trip). I kept waking up that night, not because I had trouble sleeping, but because I couldn't keep my eyes off the sky. Morning was just as nice. I worked on draining another battery on the sunrise, packed the packs and then were back on the trail before 8am. The route back quickly descended on a granite trail and into a forest filled with Red Firs. It was more lush than the route from the trailhead and I thoroughly enjoyed the stroll through that part of the forest. We crossed a dry Arch Rock Creek and made it to Lehamite creek for a needed refill of our water bottles. After the creek, the trail back takes a sharp right. The marker is easy to miss (right Tony and Rafael? ), you have to look back and to the right to pick up the route. There are a number of nice established trail camps here near the creek. Remember that paraphrased quote I mentioned? Well here is where it really came into play. The first part of the trail was a gradual climb including a section through a nice meadow filled with ferns, corn lilies and other wildflowers. After that meadow it's a steep grade and a good push back to the four way trail junction. Getting back to the trailhead seemed longer, but we eventually made it and headed back to the Bay Area. In a little more than 24 hours we hiked a great loop trail, saw some incredible sites, had lots of laughs and experienced the best night ever sleeping under the stars. I strongly encourage you to get out to North Dome and Indian Rock. It is a popular but less crowded destination and definitely a must do hike. I would rate the difficulty level of the hike a 7 (mostly because of the last steep section and length as a day hike). Below is the track on a Google Map. You can view my preliminary trip report on Trimble Outdoors. You can also view more photos from the trip on my SmugMug photo gallery. 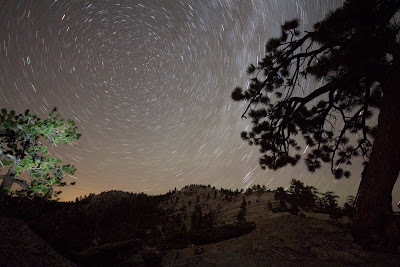 I love star trails. This is a 5 minute exposure. The focal point is the North Star. Awesome writeup Dave! I knew you would love the hike. There are lots of other hikes available up there I would like to tackle soon, too. Thanks Mark. It was a great trip and I have you to thank for it. In fact, I did! I just got back from Yosemite again and hiked up to Cathedral Lakes. Beautiful! Nice challenging climb up, but not too bad. 8.5 miles round trip. It may take a little time to get the trip report on line though. Great trip report. I've been to North Dome twice but both times did not do Indian Rock! Will have to go back. I also did Cathedral in August. 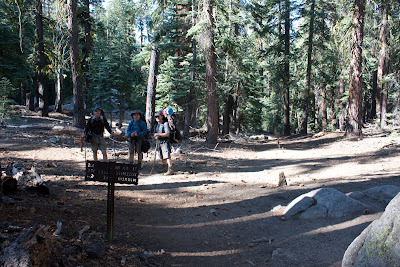 You can do a great loop by crossing the low saddle just to the right of the mountain (offtrail) and then continuing down to meet the Budd Lake trail, which goes back north along Budd Creek and connects with Cathedral Trail about a half mile from Tioga Road. 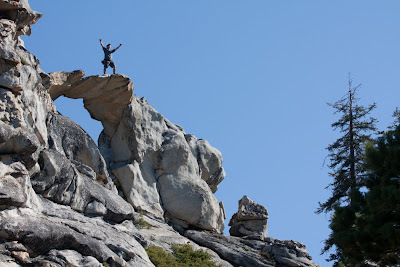 I did a day trip to Tuolumne and both Cathedral lakes last month and it was great. I hope to get my trip reports up soon. I've looked at the route to budd lake and want to do it when I have more thanks day. 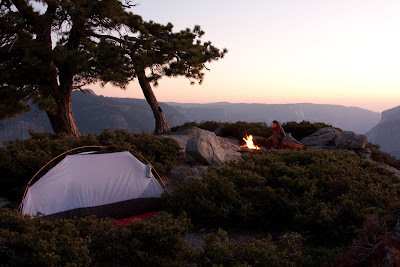 Awesome experience shared by you; Great quality Ultralight Camping tent, quite simple to put together. The second camp out it rains half the night pretty constant so we woke up bone fragments dry! The actual buy-ins it comes with tends to be okay at the best http://ultralighttent.info.